"Dr. Jin and his staff are AMAZING! Very professional, experienced, and friendly." "Dr. David Jin and his staff are the best! They are super friendly and courtesy." "Wonderful office. Dr. Jin is a very warm and caring doctor with miracle healing hands." "Honest, high quality dentist and I also appreciate the diversity of their team." A Beautiful Smile Dentistry treats you like a cherished member of the family from the minute you walk through the door. Once inside the conveniently located practice in Fort Lee, New Jersey, you can relax knowing your oral health and well-being are in the right hands. While there, the caring team aims to make your dental experience the best it can be. A Beautiful Smile Dentistry strives to spend as much time with you to give you the best care possible. Whether you have questions about your oral health or are interested in exploring a smile makeover, you get the answers you deserve. The top-notch dental team is dedicated to educating patients like you. They take the time to describe and explain dental procedures and carefully walk you through your options so you feel confident you’re making the right choice. At A Beautiful Smile Dentistry, the dental team treats every patient with the utmost value and concern. An award-winner practitioner of general and cosmetic dentistry, David Jin, DDS, takes pride in providing you with a complete selection of advanced dental care treatments. With an office equipped with the latest dental technology, Dr. Jin is available around the clock to address nearly any dental concern or emergency. Don’t worry about bothering him: Remember, you’re a part of the family at A Beautiful Smile Dentistry. More than 3,000 happy patients have joined the family at A Beautiful Smile Dentistry. Isn’t it time you did too? 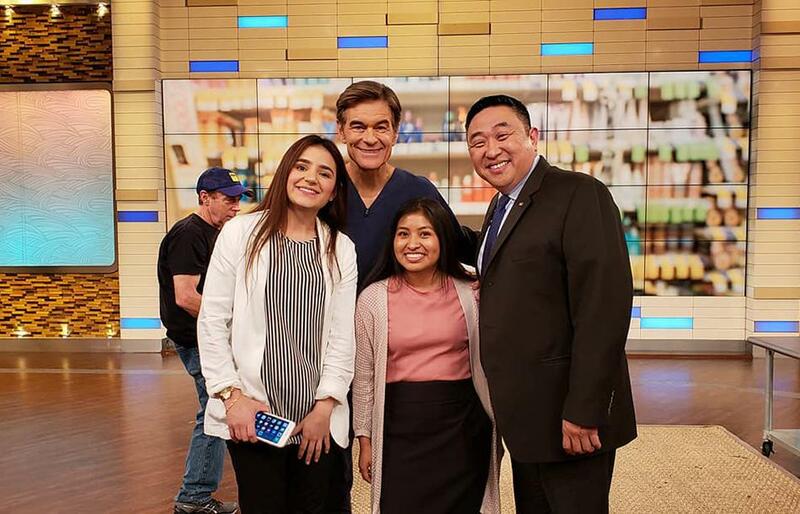 appearance on the Dr. Oz show. We accept most major insurance plans, but we do not participate in any of the Dental Insurance plans. Please call the office for additional information regarding insurance. Our Insurance Specialists will be happy to help you answer all your question by calling your insurance company and help you in finding out what is the maximum available insurance benefits. If you're thinking about orthodontic treatment but you're not sure if you want braces or Invisalign, knowing these three important differences might help you make up your mind. Dental implants are more comfortable and more secure than bridges or dentures, but those aren't their only benefits. Learn more about the benefits of dental implants and how they can help you feel more confident after tooth loss. Are you doing everything you can to care for your teeth as you age? Get 7 expert tips to protect your smile for a lifetime. "Top Dentist in NY/NJ period. I don't care what those magazines said about other dentists, you are my Top Dentist in Fort Lee." "Dr. David Jin and his staff are the best! They are super friendly and courtesy. All my appointments were always punctual, so no long waits." "You are such a terrific dentist and all the great folks that make your office the best dental practice ever!!! It's a wonderful feeling to smile without hesitation." "I appreciate your friendly staff that from the moment I came to your office, made me feel welcome. I would recommend you to everyone of my family members and friends." "We loved the fact that you and your staff work as a big family. Dr. Jin even came in 11 o'clock at night on a Saturday to see my husband for his pain." "Your needles are painless. What a blessing. Hands of magic. Thank you." "Thank you so much for your skill, and your patience explaining the incredible use of computers in your work. The results speak for themselves." "I am thrilled with Dori and Dr. Jin. They have gotten me over my fear of the dentist and I will be back to see them! No more waiting 10 years in between visits." "Dr. Jin is truly a competent dentist and is well versed in all the new techniques. His whole office staff needs to be thanked too. They are so kind and professional." "The most important to me with respect to Dr. Jin is that he always makes me feel that he is not only my dentist but my advocate and partner in deciding my dental care." "The quality of dental work and lack of pain during and after the procedures I have had done is the best I have ever experienced."